damnitz, more excellent work, the conversion of the hats into dragoon bonnets de police has come out really well. The conservatism that the French exhibited in terms of clothing helps with using the Zvezda figures the later period. I look forward to more photos as you post them. What do you use for Prussians? Have the HaT SYW Prussian figures appeared on the market yet? I think that I will be glad, when I have 2 reasonable armies. 4 bns of french line, 2 bns of foreign infantry, 1 unit of light infantry and 6 Units of cavalry and dragoons and some guns will be a good start. I hope to reach this Task in 2017. Damnitz I can understand why you don't want to paint the minions of the beastly Frederick, a man who but for the raiment of a King would be labelled a brigand and a thief! But to be serious for a change I tend to prefer a more uniform pose - most of my 10mm figures are marching (actually slope arms) or 'March attack' (more like the position 'recover'). But I have to say Ronan's recent battle report showcasing his French troops may yet tempt me into doing a few firing line type units. I remember the problems of my youth where one had to use several boxes of Airfix figures to get a unit that did not look like it was jiving! Different tastes I suppose. HaT may yet produce the sets that you mention, I seem to recall that the infantry were first mentioned a few years ago and it took some time for masters and test sprues to arrive which was well ahead of the production runs. Things may have got a littler simpler with the injection moulding side of things due to computerisation but I am nor sure that costs of set up etc have changed that much so that a production run must be well calibrated to anticipated market. As to the modelling of correct uniforms that is more problematic, many designers are influenced by the Late C19th German artists who were not overly concerned with uniform accuracy. The same can be said of many C19th British artists as well. The trouble is that it is far too often easier to copy what has been done before rather than to seek out original material. Thus we have the mistakes of the past reiterated in the present. Information on Spanish and Italian units - whilst little seems to be readily available there are Osprey-like books in both the Italian and Spanish that may off some inroads. Sadly unlike Osprey the respective publishers only tend to do short print runs for the domestic market so they sell out. Seeking these out can be a real detective exercise. To be honest I have not made much of an effort to search these out but I am beginning to be interested in Max v Browne's career and of course he served in Italy for part of the WAS. The Vinkhuizen collection in the NYPL digital collections has some useful material but one needs to be careful as not all the attributions are correct. The projected size of your army is a good starter size. Not so big as to be daunting but not too small for gaming purposes. I think this period does look best with troops in similar poses. I sometimes put a slightltly different figure at the end of a rear rank to simulate a NCO. You units are looking great. I think it's sometimes a question of you company. A lot of wargamers in germany love these action poses with casualities in the ranks of their units. Dragoons acted not as line infantry - so I thought that this informal character would match the best for these guys. Indeed I fear that you don't like than my next French infantry. I thought that it is a good idea to make the french line infantry a bit irregular as a sign of their lack of discipline. Damnitz, if you are using a mix of poses to show poor discipline that seems like a good idea. Sometimes I pop a casualty on a base, especially if I am a figure or two short to make a complete unit. In 10mm I use some of the AWI casualty figures produced by Pendraken. Not all are suitable for SYW (like American irregulars) but Leon Pengilley is such a reasonable chap that if you request only figures suitable for the SYW he will replace the ones not needed before sending out the pack. I replaced the pictures because I finished the dragoons. I'm very glad that we managed the flag better than in other units. One bn. 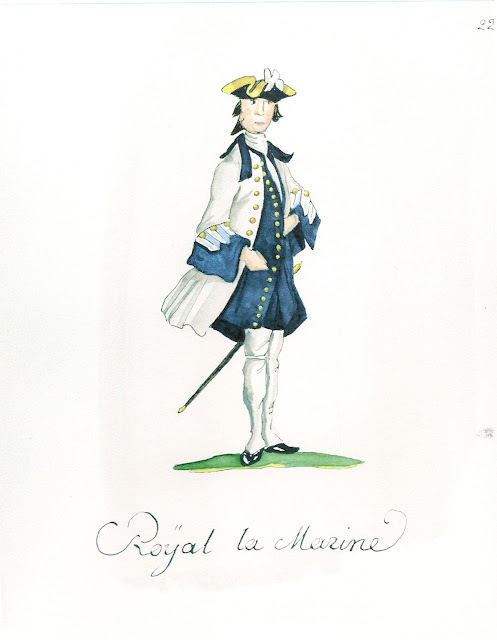 of this regiment served with the Piémont Brigade in Antoing during the battle of Fontenoy, 1745. I followed the Picture by Gudenus which he made during the French siege of Mainz in 1735. The Brigadier was painted by Mietpinsel. 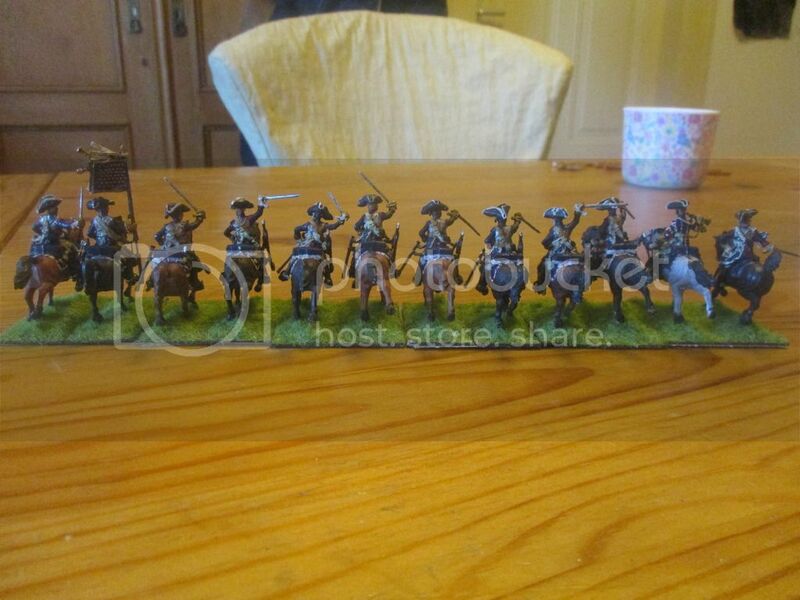 It's a prussian officer on a austrian horse (both from Revell) serving as a French General! 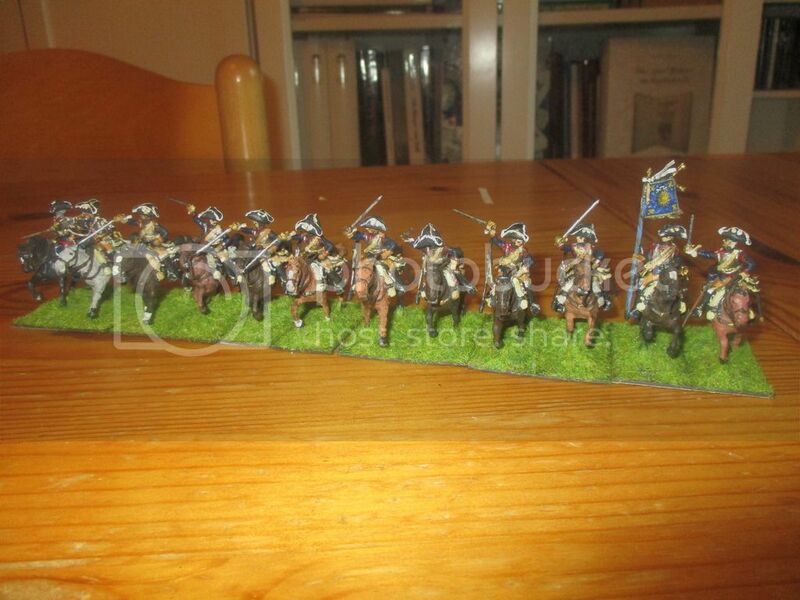 My new unit of french horse: Clermont-Tonerre Cavalerie. 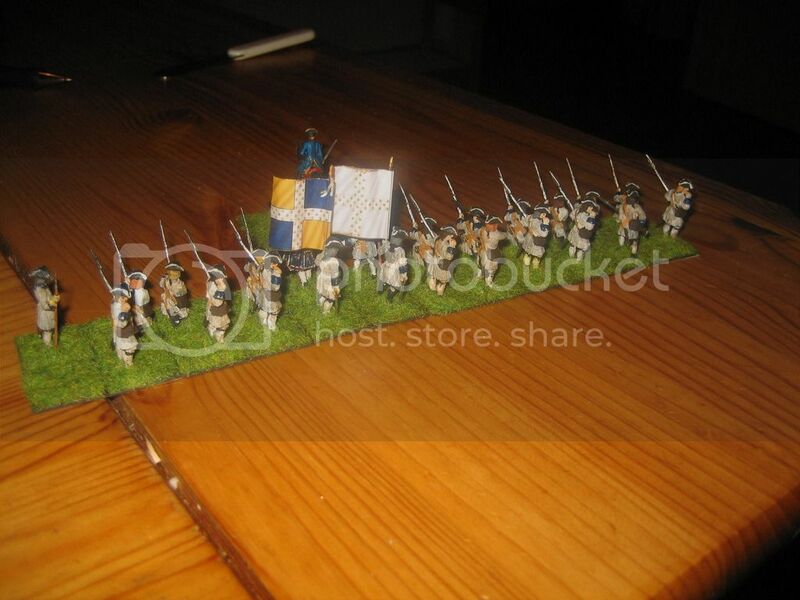 They arrived during the battle of Fontenoy. Fortunately Gudenus made a drawing of a trooper and a drawing of a "Trompette" in 1735. You will notice that I've chosen the uniform shown by Gudenus and not that shown on kronoskaf. The flag is from the french wikipedia-article fr.wikipedia.org/wiki/R%C3%A9giment_de_No%C3%A9_cavalerie following a source of 1739 and is completely different than the flag on kronoskaf. My wife changed the hat of the trumpeter (originaly with a hat). Great looking cavalry unit. Looking very aggressive and ready for anything! 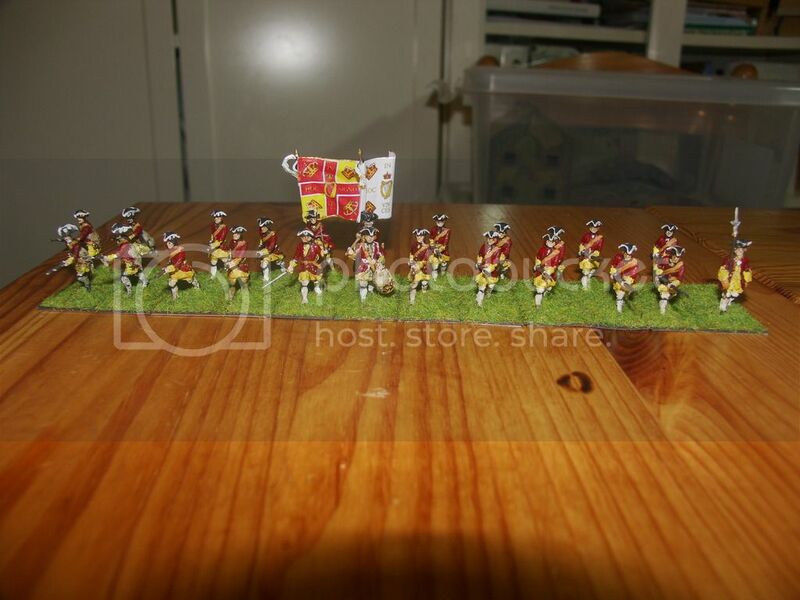 This is the first unit of irish infantry. 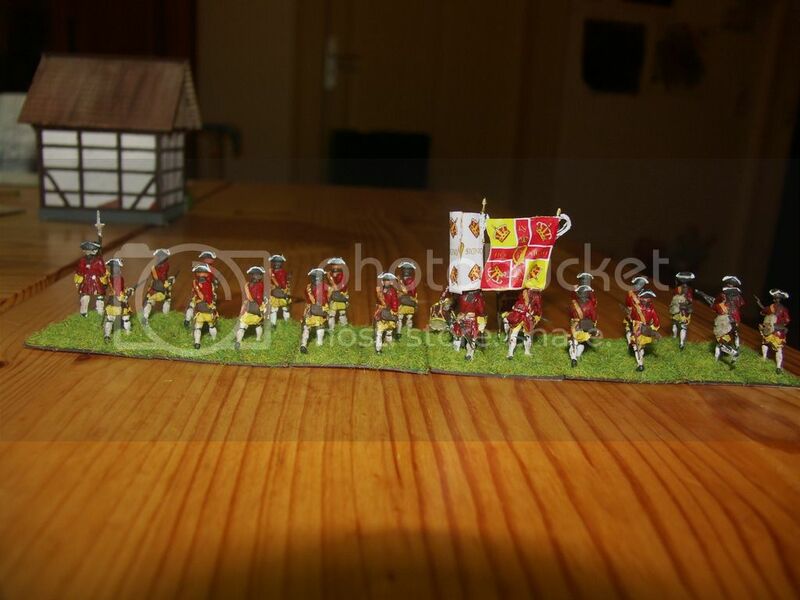 Regiment Clare, now with both flags because the Regiment had only one batallion. The figures are from different sets and manufacturers. 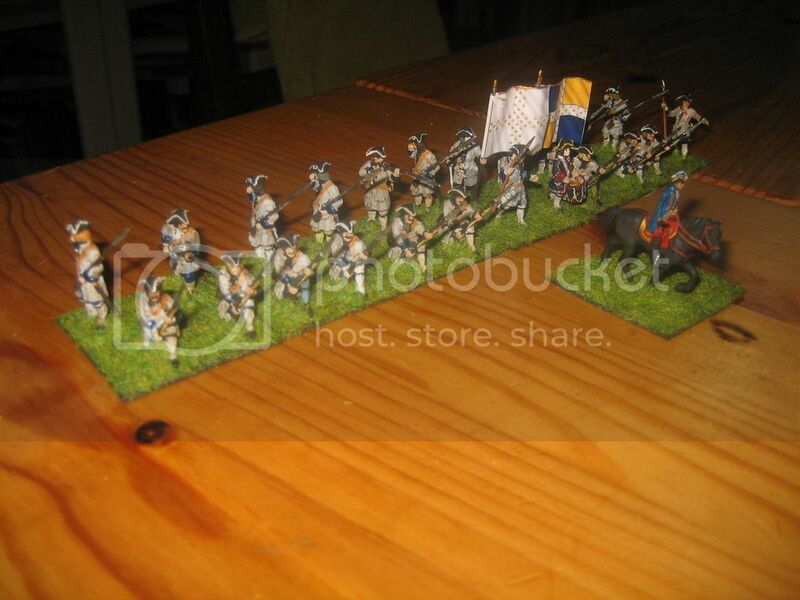 The four Grenadiers on the left are from the prussian infantry set by Revell. The fusiliers and the Drummer are from the set of swedish infantry of the GNW by Zvezda. 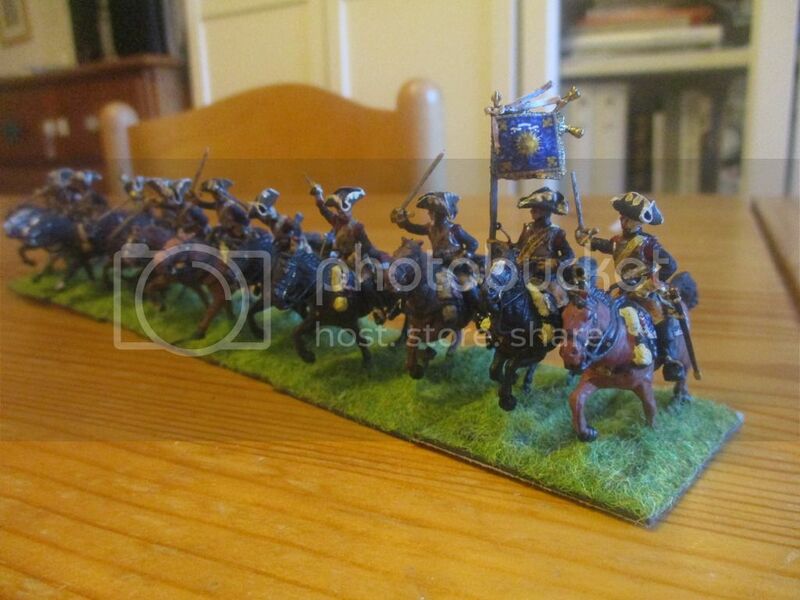 The slimmer flagbearer is from the prussian infantry by Revell too, the other flagbearer is of the russian inf. set by Zvezda. The officer on the right is by Hagen Miniatures(wfm). New French soldiers at least! 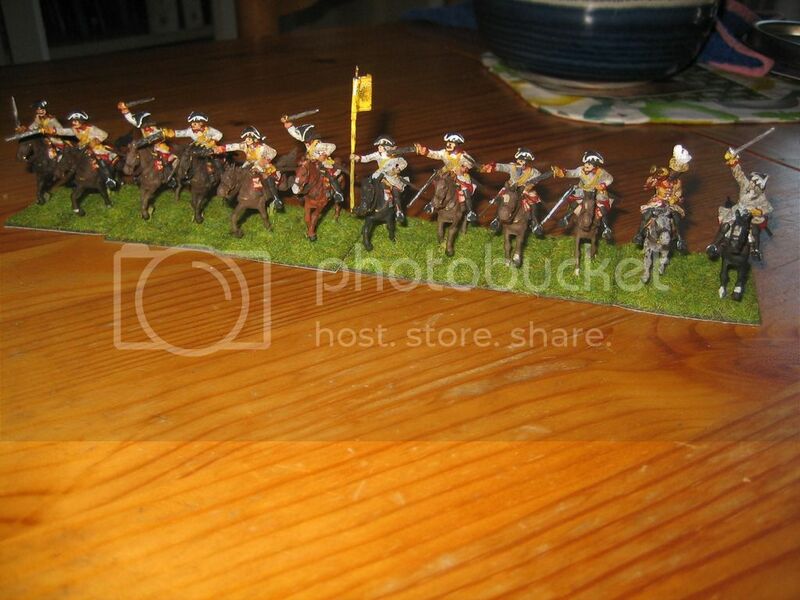 Here come the Cuirassiers du Roi. I followed the description of the "État général des troupes de France sur pied en mai 1748". The officer has a red waistcoat and breeches following the picture by Raspe. I think that such liberties among officers were not unusual. The flag is from the Kronoskaf-HP. Unfortunately Delaistre and Gudenus show no cuirassiers du roi. Therefore some aspects of the uniform are somehow speculative. Grandilhon's Fontenoy-book shows a very simplified Version of the appearance of this unit. I myself love the horse poses. Zvezda did a fine job. But to fix the men on the horses was very difficult! 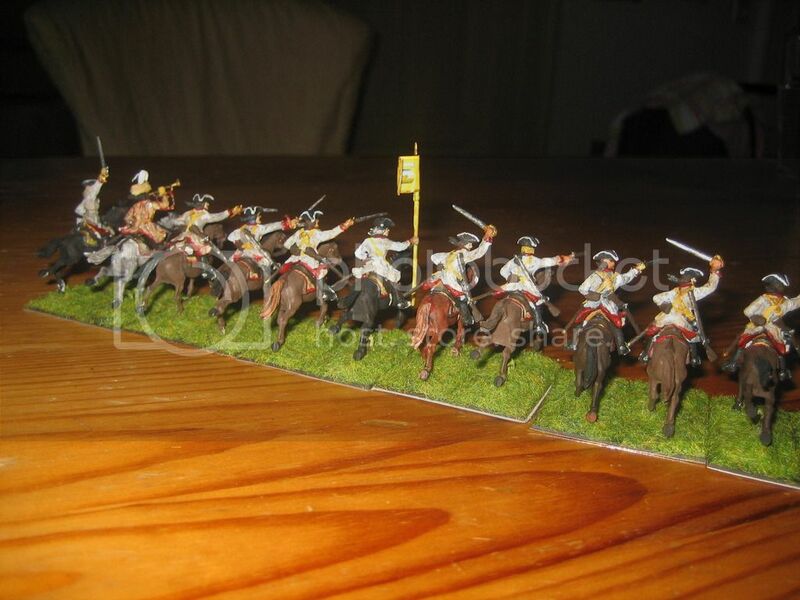 Fine looking cavalry with a superb standard.